In case our readers are curious why we have been so quiet recently, check out this article on the "fog monster" that has descended on both the Bay of Fundy and Roseway Basin. Although the fog is beautiful, and perhaps would be welcomed by our friends in the heat wave further south, it makes finding whales very difficult! Philip and Brigid on the bow in the fog hoping to hear or see a whale. The RADAR was on for safety so we had to sit on the deck to avoid its harmful radiation. 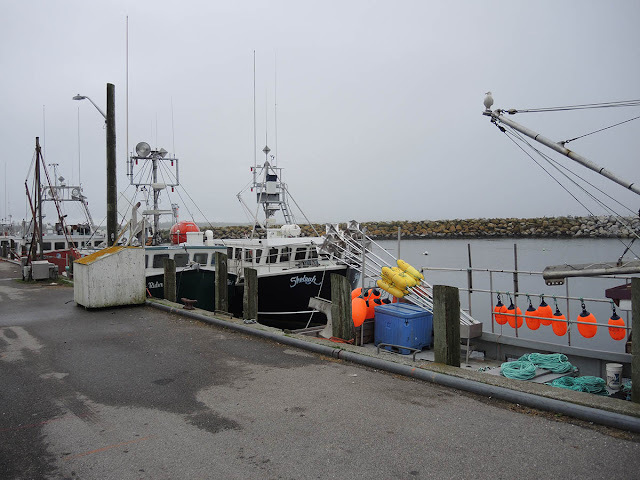 The fog is a common issue here in the Bay of Fundy; we had particularly long bouts of it in 2008 and 2012. Our fingers are crossed for a change in the weather pattern that has kept this moisture around for days now. The Roseway team left for their first offshore adventure on Monday afternoon. As we cruised through the Bay of Fundy, we worked to set up our bunks, review safety procedures and familiarize ourselves with the vessel. With the goal of getting to Roseway on Tuesday morning, we steamed through the night, rotating teams of two at the helm while others slept. Sam tries on a survival suit. 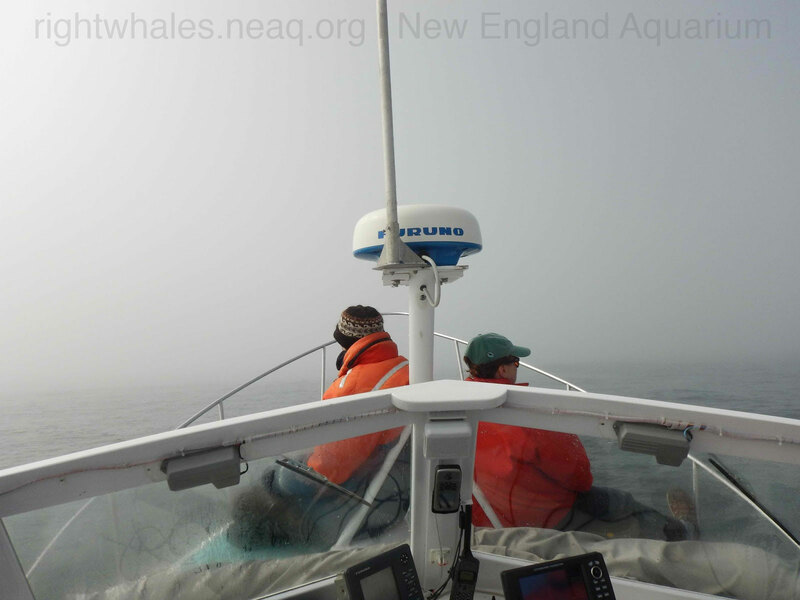 We started surveying at the western edge of the Basin once some fog had cleared up, and surveyed throughout the day. We completed one full track line and nearly half of another. Sadly, we did not find any right whales (same as our colleagues back in Lubec). 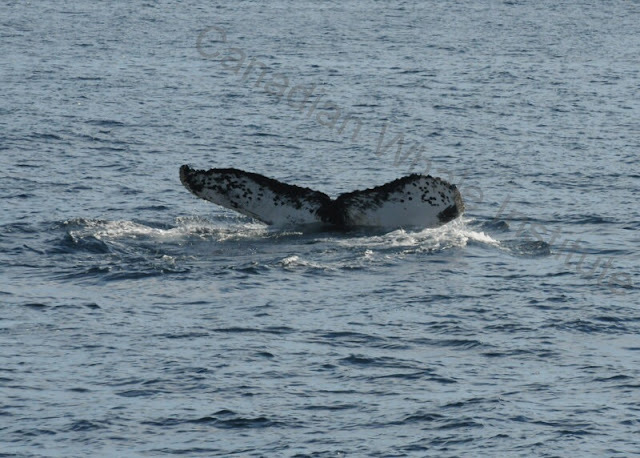 Many common dolphins were seen, but few large whales were sighted: 3 fin, 3 minke and 3 humpbacks. We spent some time in the afternoon practicing our photography skills with a humpback. Having kept an eye on the weather, Moe and Joe knew that Wednesday was not looking favorable; in fact, a system was approaching with strong winds, rain and fog. Heading in to port so soon after leaving was a bit disappointing, but getting beat up at sea would have been worse. We docked at night alongside fishing boats, and got a good night's sleep. This morning, Sam spoiled us with a pancake breakfast, we refueled the Shelagh, and our data protocols were reviewed. The port is covered in fog and rain showers have passed over us several times. We're checking the forecast, and hopefully will be back on Roseway sooner than later! After our office was all set up and we had completed most of our on-land training, the weather finally improved and we headed out to sea on Friday. Even though I have been doing this work for 29 years, I am still astounded by how much equipment and gear we take each day! 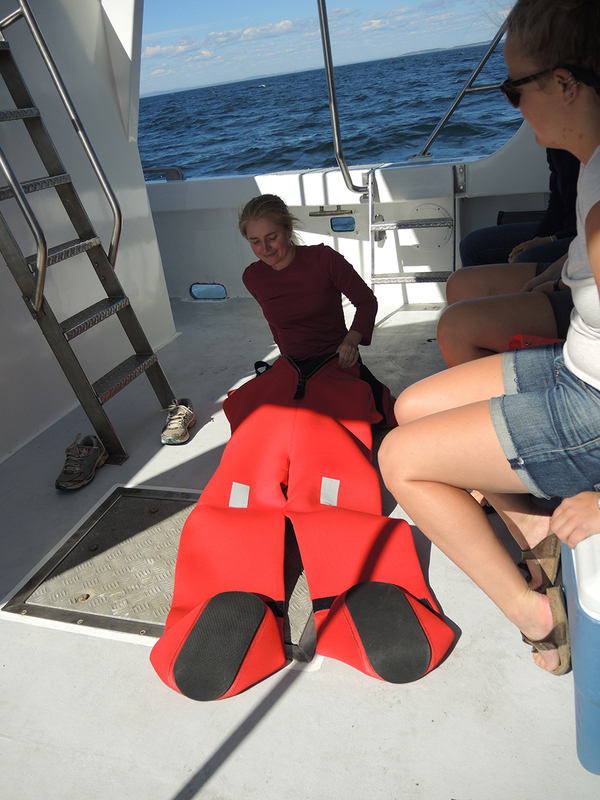 Sam, Molly, and Brigid waiting for the R/V Nereid to dock so we can load our gear and equipment for the day. The first day at sea each year is always particularly exciting as we have no idea what we might see. It was a beautiful day with calm seas and clear skies. An hour into the survey, we had our first large whale sighting near Grand Manan island- a minke whale lunging through the water and surfing in our wake. Little is known about these small (30 feet), enigmatic whales and it was a great way to start the day. This is what the scene looked like from above water! 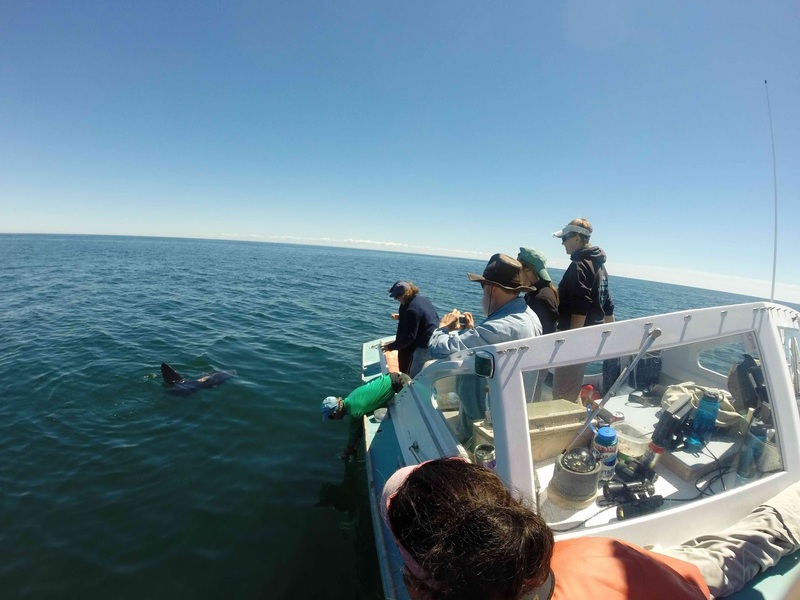 While out in the Bay, we talked with our colleagues from the Grand Manan Whale and Seabird Research Station who did a plankton tow recently and they reported very little plankton in the water column. No plankton means no right whales. But conditions can change quickly out there, so we are hoping the plankton resource will improve and right whales will come into the Bay soon. As we approached shore at the end of the day, we received a report from our colleagues at the Northeast Fisheries Science Center that they had seen 25 right whales in the Gulf of St. Lawrence- the first aggregation of right whales reported since they left Cape Cod Bay in May! It is a dynamic ocean and conditions are frequently changing. Soon, our team will split up and begin the search for right whales in different areas than BOF. Although sad to see our colleagues go, we are all excited to see what they will find. This season we've invited new faces to the team to introduce themselves and provide a little background on what led them to our research program. First up is Brigid! Hi! My name is Brigid McKenna and I am one of the seasonal research assistants on the NEAq right whale team. This is my first full field season here in the Bay of Fundy, though I'm not completely new to the team. Last year, I helped out on the R/V Nereid for a few weeks shortly after I finished my masters at the University of St Andrews. Brigid and Walter (dog pictured at left) have been a wonderful addition to the team. I started participating in marine mammal research in 2010 through Whale &Dolphin Conservation (WDC), with a focus on Gulf of Maine humpbacks. Since then I have been involved with another humpback research program at the Center for Coastal Studies (CCS), spinner dolphin work in Hawaii through the SAPPHIRE project (Duke & Murdoch Universities), and have recently been collecting data on right whales at CCS on both vessel and aerial platforms. 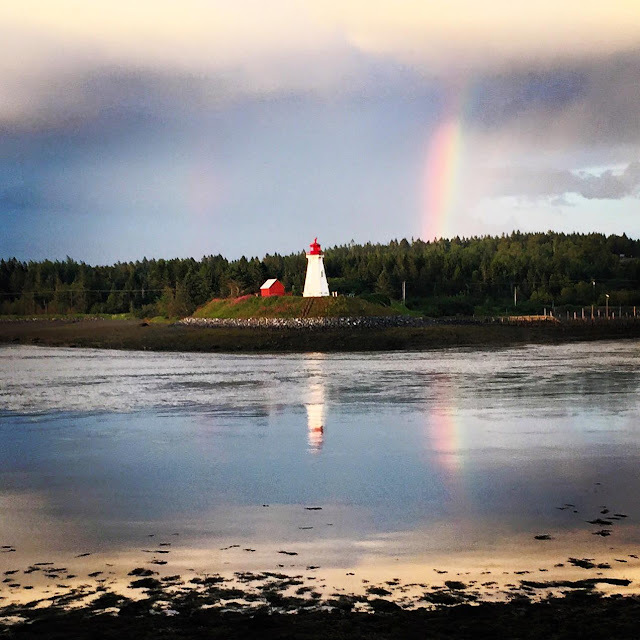 I am really excited to be back in Lubec this year with my dog, Walter, and ever more stoked to be going out on the water to see right whales in this habitat. As I type, we are settling in to our field station in Lubec, Maine. 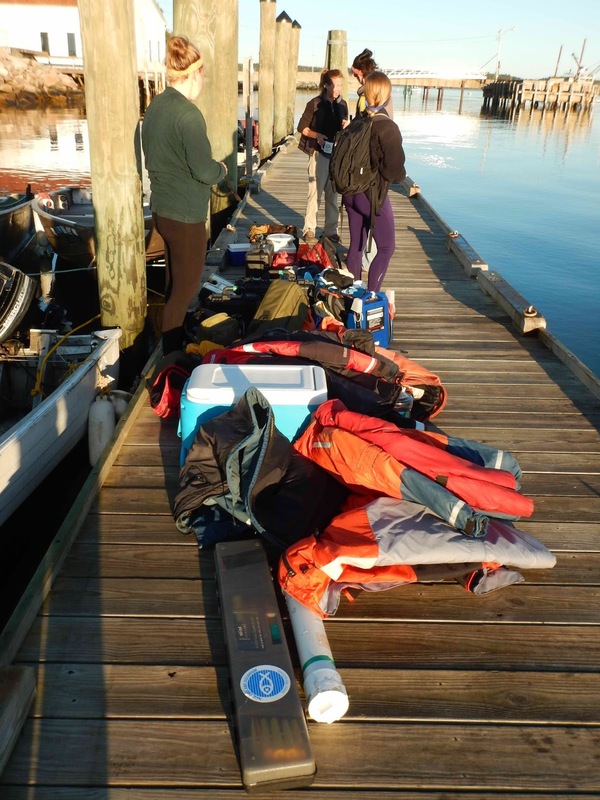 Seasonal staff and interns are arriving, we are setting up our equipment and readying our boats. The weather looks bad for a few days, but we are hoping for our first day at sea after that. We are all excited and curious to see what is out in the Bay of Fundy. Setting up our field station can take a few days! But I am writing now to share some happy news! Back in January of 2013, the right whale community was stunned when a well known right whale, Wart (Catalog #1140), gave birth in or near Cape Cod Bay. Wart had the right time of year, but a very different location for most calving females who calve off Florida and Georgia. We were all concerned that the cold northern waters would be too much for the newborn. We knew the calf survived for at least several months as we reported on the Aquarium blog. But how would this little one do once separated from its mom? Wart's 4 month old calf playing in Cape Cod Bay on April 28, 2013. Photo taken by Amy Knowlton/New England Aquarium under NOAA Permit #14233. Well, recently we discovered that Wart's 7th calf is doing just fine! It was seen on January 5, 2014 in Cape Cod Bay, and then several times on April 25th, 2014 still in Cape Cod Bay. It was feeding and looks very healthy. 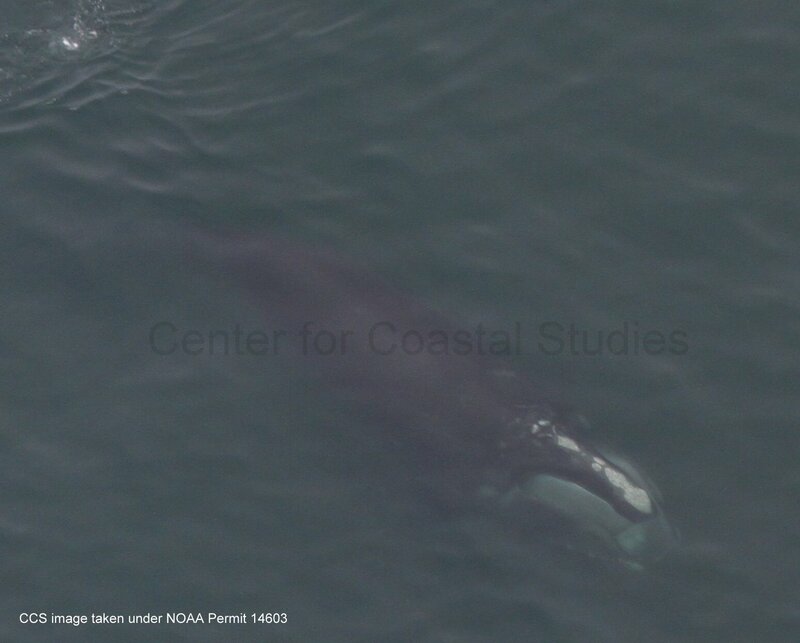 Wart's 2013 calf #4340 feeding in Cape Cod Bay April 25th, 2014. Photo taken by Christy Hudak/Center for Coastal Studies under NOAA Permit #14603. The photos were good enough that we were able to Catalog this whale as #4340. You can see photos and past and future sightings by searching for the Catalog number on the Catalog website. Who knows, maybe #4340 will be waiting for us out there in the Bay of Fundy.